Flower Contest Registration...Click here for information and form. We wish to thank all of those that submitted entries for the Village Flag Contest. They were all great entries and it was hard for the judges to come up with just one winner. Judging for the contest was held at the Town Council meeting on 03/25/03. There were eight (8) entries. The judges were Mayor Karl Bowers and George Smith. Each chose a separate entry so council members, Danny Starkey and Maureen Kull voted to break the tie. The winner of the Flag Contest was Justin Utter. Congratulations Justin! This is something to be proud of for it means a lot to our village and it will represent our village for many years to come. We appreciate you sharing your creativeness with us and for helping to create a better image for our village. For the present time, a picture of the flag will be posted in the town council window. When the flag has been created, the actual flag will hang in the window until the flag pole at the park has been installed. So keep watching the window to watch the changes and advancement of this project. Spring is Approaching - Start Planning for the Contest and get your registrations in before the deadline! Ohios Bicentennial is coming this year. In celebrating this event many Ohioans are joining together to pay tribute to the people, places, things and events that helped our state to carve a rich place in American and world history. 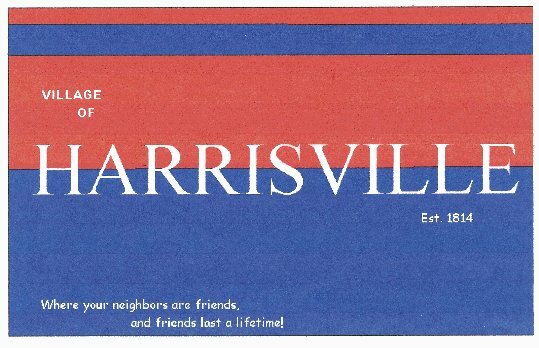 Even though Harrisville is a small community and plays more of a silent part in its history, some energies are beginning to come alive that show that our community and ancestors are very much a part of these people, places, things and events in which tribute is being paid. In order to participate in the Ohios Bicentennial, our community is holding a Flower Contest. Plan ahead and join in for there will be cash prizes awarded to the 1st, 2nd and 3rd place winners. There will also be prizes awarded to those that show the greatest effort and end result in beautifying the community in other ways other than gardening! *Flower areas must be within town limits. *Do not need to be resident to enter. *Can plant areas on community or empty lot areas...but must obtain permission from either town council or property owner before planting and registering. *Cash Prizes will be awarded to the 1st, 2nd and 3rd winners. *Locations will be judged on beauty, neatness, creativity, originality and perfection. *Most improvement to property safety such as porches, sidewalks, pathways, fences, etc. *Most removal and/or cleanup of debris, trash, unorganized materials and supplies. *Greatest assistance given to neighbor, other residents, or community to help cleanup or improve property and community. THESE PRIZES WILL BE AWARDED BY NOMINATION OF FELLOW NEIGHBORS AND RESIDENTS. TO SUBMIT NOMINATION CALL 546-9915 OR 546-3321.